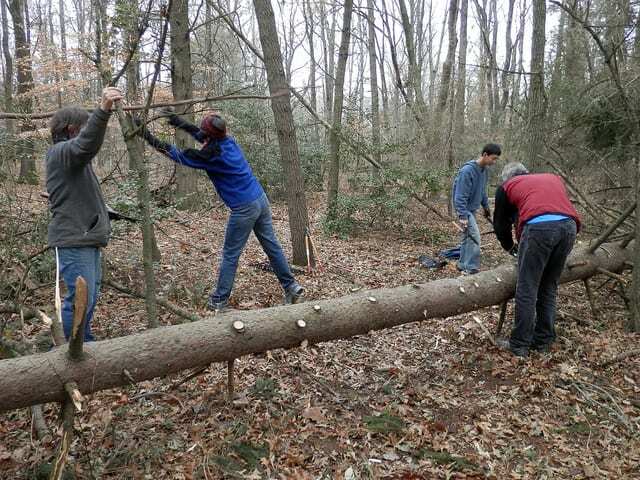 Thanks to 20 volunteers who came with handsaws, loppers, chainsaws and more on Saturday, Dec. 1, the Millstone Preserve trails, the Millstone West trails and the last of the Rogers Preserve trails are now cleared of fallen trees and other Sandy damage. Our group ranged from a kindergartener armed with small loppers who attacked those invasive thorny green vines to a longtime resident in his 80s who helped cut branches with his handsaw. The group also included two other elementary school students and two high schoolers. Three volunteers with chainsaws allowed us to clear the biggest trees, and our own “lumberjack” even got Santa to deliver his Christmas chainsaw early. It is amazing what such a group can do in less than two hours! We also are thankful for some neighborhood “trail elves” who cleared some trees in Millstone Preserve before we arrived and the five volunteers who stayed for an extra two hours to remove more downed trees. We left most of the leaves on the ground to fight against mud and soil erosion, so please let us know if you find some trails difficult. Trails in the Rogers Arboretum and Zaitz Preserve still need to be cleared. 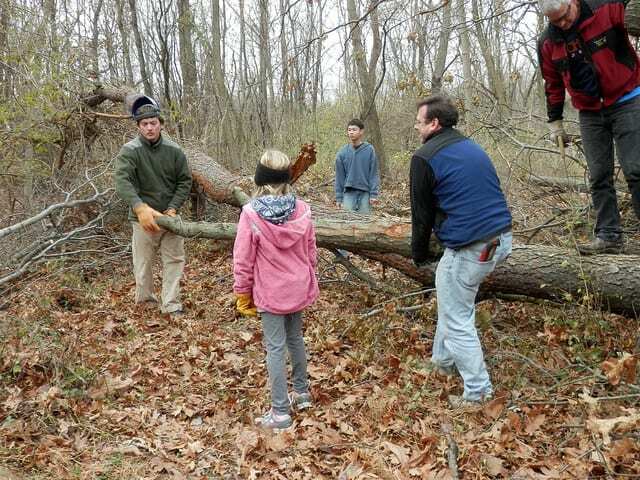 We plan to tackle Rogers Arboretum at 10:30 a.m. on Saturday, Dec. 15, weather permitting. Join us in the arboretum parking lot on Clarksville Road. Once again, we will aim to finish by 12:30 p.m.